The cerebral palsies (CP) are a heterogeneous group of non-progressive motor disorders of the developing brain. By convention, brain injuries occurring at any stage antenatally and postnatally to the age of 2 years are included in the definition of CP. Primary disorders of the spinal cord such as neural tube defects, neuropathies, and myopathies are excluded. Cerebral palsy should be viewed as part of a “continuum of reproductive casualty”,1 comprising miscarriages, stillbirths, and severe and minor brain injuries. Consequently, the incidence and causes of CP are a matter of great interest since they provide a benchmark of reproductive health. The incidence of CP in developed countries is stable at about 2–2.5/1000 live births. 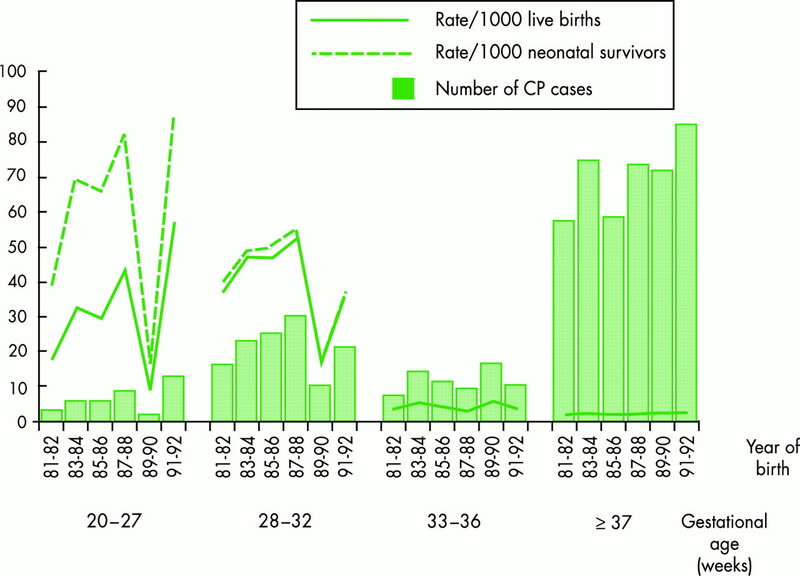 The risk of CP for premature babies is 5–80/1000 live births, though the majority of cases of CP are term born babies (fig 1). Cerebral palsy rates and numbers (excluding cases due to postneonatal causes) by gestational age and year of birth in Western Australia, 1981 to 1992. Prematurity is defined as birth below 37 weeks gestation. Note that although the rate of CP is higher for the preterm baby per thousand live births (lines), term births account for the majority of cases of CP (histograms). Modified from Stanley et al,31 by permission of MacKeith Press. There are many ways of classifying CP, but the simplest is according to number and distribution of affected limbs: monoplegia, hemiplegia, diplegia, triplegia, and quadriplegia. As a rule, hemiplegia is associated with late third trimester injuries. By contrast, the risk of bilateral brain injury increases with prematurity. The various means of classifying the cerebral palsies are summarised in table 1. The modified Swedish classification shown in table 2 is most used because of its simplicity. The relation between gestational age and CP phenotype is well established (table 3). 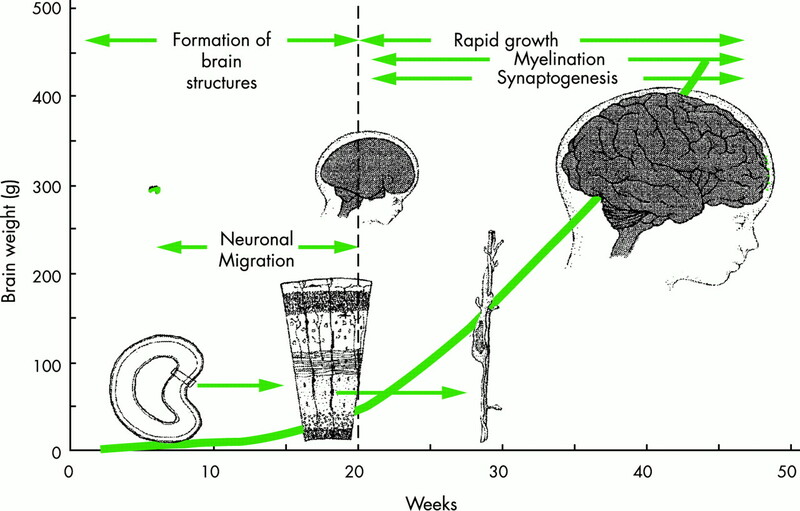 A knowledge of the sequences of embryonic and fetal brain development establishes the timing of brain injury (fig 2). The finding of disordered migration, such as lissencephaly or grey matter heterotopias, indicates damage occurring before 22 weeks gestation that disturbs normal neuronal migration (see article by Verity et al, page i3). 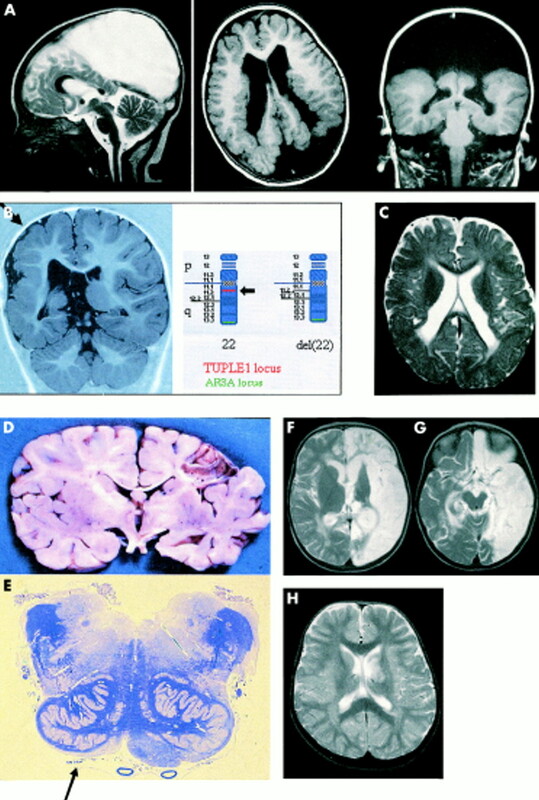 Periventricular leucomalacia (PVL) denotes destruction or wasting of the white matter. The susceptibility of fetal brain to PVL varies according to gestational age, peaking at 28 weeks with a steep fall in both early postnatal death and PVL thereafter (table 4). PVL presents as diplegia and accounts for about 70% of CP in babies born before 32 weeks gestation and 30% of CP in term born babies—suggesting a common antenatal origin during the period of oligodendroglial activity and resultant myelination. Late third trimester insults tend to affect both grey and white matter structures, resembling the typical stroke patterns encountered postnatally (fig 3). The risk factors for PVL are listed in table 5. Brain development during gestation and early postnatal life. Injuries between 15–22 weeks gestation result in neuronal migration defects. After about 22 weeks gestation, the oligodendrocytes are vulnerable to injury and white matter wasting periventricular leucomalacia associated with ex-vacuo expansion of the lateral ventricles is the dominant clinical pattern. Towards 40 weeks gestation (term), cortical and subcortical injuries become more common along with damage to the basal ganglia. Illustration courtesy of Dr Wayne Squier, Radcliffe Infirmary, Oxford, and Mac Keith Press. Neuroimaging and neuropathology of the “cerebral palsies”. Note the heterogeneity of brain disorders. (A) Bilateral schizencephaly with grey matter lining the ventricles. This boy had visual function but it is not clear where the “visual cortex” is located. Note the effects on the corpus calosum. He had some head and trunk control but no mobility. His main clinical problem was intractable seizures and feeding difficulties. (B) Right hemisphere polymicrogyria (arrow) secondary to 22q deletion presenting as a classical left hemiplegia in the second six months of life. This girl has no fits, no feeding difficulty and no speech problems. She is not prone to infection. She walked at a typical age for hemiplegia (18–22 months). The left hemisphere is normal. This is yet another example of the importance of scanning children with CP. (C) Periventricular leucomalacia (PVL). Scan taken at 10 months of age. Born prematurely at 27 weeks gestation. Note how the posterior horns of the lateral ventricles abut on the cerebral cortex along with an extremely thin corpus calosum. There is high signal change in what remains of the white matter. In contrast with hydrocephalus, the ventricles have sharp outlines indicating they are not under pressure. (D) Coronal section through hemisphere of 8 month old infant showing old left cortical–subcortical infarct with thin internal capsule. (E) Transverse section through the medulla of the same infant as in panel D. Note the virtual absence of the pyramid on the right (arrow, E) due to a loss of descending corticospinal tracts. (F) Devastating destruction of the left hemisphere from herpes simplex encephalitis at 18 months of age. This girl lost the power of speech, feeding, sitting, and walking in the acute phase but regained all these over the following year. She is prone to seizures which are controlled with anticonvulsants. Despite her tremendous recovery, she has a dense right homonymous hemianopia and hemiplegia (without neglect) with learning difficulties. Note the smaller left cerebral peduncle in panel G. (H) Left post-varicella “capsular infarct” in a male toddler. The lesion involves the internal capsule, lentiform nucleus, and thalamus. All of these pathologies may be said to contribute to the “cerebral palsies”. “Dyskinetic” CP accounts for less than 10% of all forms of CP, occurring more commonly in the term baby. Kernicterus from haemolytic disease of the newborn caused by Rhesus iso-immunisation explains a higher incidence in past decades. The introduction of the antenatal policy of administering “anti-D” antibodies to Rhesus negative mothers after the birth of a Rhesus positive baby has led to virtual eradication of this whole class of CP type. Neuroimaging, in particular magnetic resonance imaging, has helped clarify issues of causation and timing, shifting the debate away from intrapartum events (birth asphyxia) which probably accounts for 10% of cases, to an examination of antenatal factors or “antecedents”. PVL now stands out as the major class of injury and cause of bilateral CP. Reducing the incidence of PVL would be an index of effectiveness of a modern healthcare system. The probability of CP rises with increasing prematurity, multiple pregnancies, and events such as intracranial haemorrhage, meningitis or neonatal seizures. Such events should raise concern at the possibility of developing CP. A failure of the head to grow at the appropriate rate for age is a reliable indicator of serious brain dysfunction. Overriding of the cranial sutures and premature closure of the fontanelle, indicating microcephaly, is an early palpable feature of this. Such signs in conjunction with the following features raise concern regarding future motor impairment. Persistent feeding problems can also be an early sign of future expressive language difficulties. Early assessment of communication, under the auspices of speech and language therapy, is essential to facilitate appropriate means of alternative communication. This is vital to maintain the child’s cognitive development. Pronounced hypotonia is an important early sign of neurological impairment and, in the absence of a systemic cause, should prompt detailed investigations. Floppy babies may develop dystonia or dyskinesia towards the end of the first year. A lack of variability of limb movements or sustained or “cramped” postures also indicate possible motor problems. The diagnosis may “come out of the blue” after a period of apparent normal growth and development: this is because the infant under 3 months postnatal age (after correcting for prematurity) functions essentially at the diencephalic motor level, with little hemispheric contribution. The newborn adopts an obligate flexed limb posture, and over the next 3–4 months the limbs extend and primitive reflexes such the rooting, grasp, and asymmetric tonic neck response are lost. Persistence of these signs beyond this period, indicating a regressed neonatal posture, may be the first indication that something is amiss. For the parents of preterm babies who have had an “uneventful” neonatal course, the risk of CP remains and may come as a shock when it emerges later in infancy. Since the majority of cases of CP are born at term, it is only with the observation of consistently abnormal postures or the lack of acquisition of normal milestones between 3–8 months that the motor disorder becomes apparent and medical advice sought. Neonatal and infantile seizures suggest underlying structural brain disease with the possibility of adverse motor consequences. Although structural injury increases the likelihood of infantile spasms and later seizures, the most vulnerable group of children are those with quadriplegia and hemiplegia with pre-existing cortical involvement, seizures affecting some 20% of cases.3 Diplegic children infrequently develop seizures highlighting the relative sparing of the cortex. Hearing loss associated with microcephaly, microphthalmia, and congenital heart disease should prompt a search for evidence of TORCH infections (toxoplasma, rubella, cytomegalovirus, and herpes simplex). Kernicterus typically causes high frequency sensorineural deafness in conjunction with dyskinesia. Neonatologists, health visitors, paediatricians or community paediatricians usually make the diagnosis. Parents often express the concern that their doctors have only belatedly recognised signs of CP, seeing this as medical failure. However, unlike neurological illness in the developed nervous system, signs remain masked until the structures are mature enough to declare them. Consequently, most clinicians are prepared to delay the formal diagnosis until the second birthday. The National Collaborative Perinatal Project in the USA7 endorses this caution as two thirds of children diagnosed with “spastic diplegia” and half of all children with signs of “cerebral palsy” at their first birthday “outgrew” their symptoms by the age of 7 years! An understanding of the natural history of CP is essential for a proper prognosis and provision of support services. Important items include the prognosis for life expectancy, walking, and hand function. Children with total body involvement and bulbar difficulties, necessitating alternative feeding, are vulnerable to severe respiratory illness and early mortality. Strauss and colleagues8 looked at the causes of mortality in 45 292 persons with CP. This population comprised 32% with severe CP (77% quadriplegic), 33% with moderate CP, and 22% mild (34% quadriplegic), the rest being unclassified. The standardised mortality ratios (SMR—ratio of observed to expected deaths) for CP are given in table 6. For all ages, the SMR is significantly raised. There is a sharp fall in SMR after 14 years though mortality remains higher from ischaemic heart disease and cancer than in the general population. Once long term survival seems likely, mobility next concerns parents. Walking is a “gross motor” skill, while hand function is a “fine motor” skill. Walking relies on maturation of truncal balance and the production of rhythmic, reciprocating leg and arm movements. Bronson Crothers and Richard Paine, in their classic text The natural history of cerebral palsy,9 produced a cumulative percentile chart for walking, defined as the ability to walk 10 independent steps, against age and neurological features in a large cohort of children. Walking outcomes, not surprisingly, were dependent upon whether CP was unilateral or bilateral. Approximately 80% of hemiplegics walked by the age of 2 years, compared to 25% of all other phenotypes. By 3 years of age 95% of hemiplegics are walking compared to 40% of other groups. However at 5 years 60% of tetraplegic and 65% of dyskinetic children walk. “Treatments” that claim to improve motor function (of which there are many) may be “hitching a ride” on the inherent motor maturation of the child. Whereas tetraplegic children cease to acquire further useful walking skills after 10 years, the dyskinetic child’s walking may continue to improve slowly throughout adolescence—an important positive point for parents. More recent data have questioned this classic study. A cohort of children with bilateral CP born in the south east Thames region of the UK between 1989 and 1992 were superimposed on this predictive graph, with only 38% of children walking independently at five years (1997), compared to twice that number 40 years previously. Difference in case mix would seem a logical explanation of such discordant data. if sitting is delayed beyond 3 years, the prospects for functional outdoor walking are remote. Some other early motor skills can be used as predictors, such as head balance in prone position by 9 months, or crawling by 30 months. Consequently, much of the child’s future walking potential can be discussed sensitively at an early stage. A good grasp of prognosis helps tailor realistic therapy programmes to achievable goals. According to Crothers and Paine,9 walking, once achieved, is maintained through adult life. Is this true? Andersson and Mattsson11 have addressed by questionnaire the quality of walking in adult CP (table 7). Thirty four per cent of their cases with bilateral CP never walked. A further 11% of those had stopped walking, half before the age of 14 years. They found that although none of the hemiplegic adults stopped walking, 19% experienced a decline in walking skills, as did 42% for adults with bilateral CP. In this group 60% experienced joint pain with 50% having deformities in two or more joints. Hand function: use it or lose it? Hand function remains an under researched area. However, two management approaches in children and adults with CP have recently emerged. The first is based on evidence that the dominant hand becomes so dextrous that the impaired hand is ignored—so-called “conditioned disuse”. Videos of toddlers with hemiplegia may show relatively good early function on the impaired side which appears to be lost over time. This early disuse may be reversed by “constrained inhibition” of the good hand, thus imposing forced use on the less functional limb. This technique has produced impressive short term results, but further evaluation is required. The second approach is based on studies of anticipatory control. Motor planning is enhanced by repetition which refines subsequent performance. Gordon and colleagues12 showed that hemiplegic children can use information about the weight and texture of objects obtained when using the good limb for anticipatory control using the impaired limb. Both of these lines of enquiry have given new impetus for developing new motor management strategies in children and adults with CP and are also being applied to adults after stroke. Child neurology has to be understood in the context of the developing brain. In the cerebral palsies, the child has in most cases known no other motor state and has never experienced the loss of previously acquired function. Brain development may be slowed in CP as in many other genetic and environmentally provoked disorders. An understanding of the normal stages of physiological maturation of the motor system at each of these different ages, coupled with a knowledge of dysfunctional neurophysiology, is a prerequisite for establishing an accurate diagnosis, prognosis, and management of the individual child. A developmental history is essential for identifying active functional problems and motor goals. Families may have a poor understanding of what their child can do or unrealistic expectations of what may be achieved in the future. In general, a history of recent improvements in motor function, particularly endurance and performance, offers indicators to future performance. There is usually less scope for change when a motor skill has remained static for long periods. Assessments thus help to clarify current achievements. Dividing up the motor assessment into different components identifies specific difficulties. Unfortunately, the neurological nomenclature which divides cases into spastic, dystonic or ataxic does not readily give much clue to the specific problems of each individual. Indeed, neurology is festooned with terminology that is often used imprecisely (for example, “pyramidal signs” and “spasticity”). This usage does not add to the clinical picture or give guidance to management. It is best to adhere to operationally derived observations, which are physiologically valid and more easily monitored. It is apparent that the cerebral palsies should be considered as a disorder of movement dominated by weakness and poor selective motor control. Abnormal motor sequences13 and synergies such as co-contracting agonist–antagonist muscle groups lead to abnormal walking. However, co-contraction of leg muscles during standing and walking along with the adoption of a “crouch stance” is normal in the first year to 18 months of life.14 The advent of the heel-strike foot contact pattern is considered a hallmark of a mature gait though this takes time to develop. A third of healthy children over the age of 7 years show electromyelographic (EMG) evidence of co-contraction.15 Inappropriate muscle activation sequences lead to postural perturbation and spontaneously generated involuntary movements or postures. These phenomena engender associated and compensatory movements which add to stereotyped and often mass actions. Motor immaturities persist in the cerebral palsies (for example, arm posturing with an equinus gait) but may improve with specific interventions to relieve impairments. Labyrinthine input13 is important in determining much of the inappropriate posturing in so-called “spastic diplegia”. Excessive tonic labyrinthine input significantly interferes with voluntary movements that vary exquisitely with change in head posture and other non-specific afferent inputs (emotions, hunger, pain) affecting arousal. Sleep abolishes labyrinthine dependent postures. The effect of deep sleep on the child should be recorded, since helping the child achieve a good night’s sleep may significantly relieve night cramps and also reduce progression of contractures through relaxation. Inappropriate muscle activity may produce very disabling symptoms such as overactive quadriceps and plantar–flexor muscles impeding clearance of the foot in the swing phase of gait or in climbing stairs. While this may be helped by treatment it is not useful to reduce reflex excitability or dystonia at the expense of truncal control, sedation or increased drooling. In addition patients with CP develop muscle stiffness and contractures. Muscles become stiffer (less compliant) owing to changes in the muscle tissue itself.13 This stiffness is not dependent on muscle depolarisation and cannot be reversed with muscle relaxants. Contractures are posture dependent and arise through disuse and weakness. The risk of multilevel contractures increases with age. Relief from contracture may be achieved with plaster immobilisation under moderate tension achieved with “serial casting” at graduated increases in joint angles.16 Soft tissue and bone surgery (in experienced hands) is often required, usually at more than one level, to relieve deformity and improve function. A simple scheme for observing gait allows clinicians to address specific problems. The essential parameters for a functional gait are: (1) stability in stance; (2) clearance of the foot during the swing phase; (3) prepositioning of the foot before foot contact at terminal swing; (4) adequate stride length; and (5) energy efficiency. Attention to these simple stages will facilitate decision making and allow a rational management approach. Instrumented gait analysis may be helpful in complex gait disorders. Detailed assessment of the individual will allow appropriate tailoring of the treatment programme, this being specifically goal directed. Goals provide the motivation to comply with treatment. It is not sufficient for the clinical team to alter impairment variables (for example, joint angles, x rays or EMG signals) if the patient and family see no meaningful improvement. Issues of motor performance (including efficiency and motivation) are complex. The approach needs to involve a multidisciplinary team assessing needs and determining priorities, with a long term commitment to the interests of both child and carers. Having reviewed the evidence, and mindful of the natural history, the team may elect to use many different sorts of treatments to promote movement and prevent deformity. Muscle strengthening through goal directed exercise must play a prominent role.21 The management of dynamic contraction with local botulinum toxin injections or systemic medication will depend on the severity and distribution of the problem. Relief from contractures through serial plastering16 has been shown to be effective in some, but multilevel soft tissue surgical releases or transfers may be necessary. Many will need graded exercises21 and often orthoses. Also invasive measures such as intrathecal baclofen22 play a role in severe spasticity as well as in disabling total body dystonia.13 Selective dorsal rhizotomy for spasticity is still widely practised in the USA, but long term results are raising doubts about sustained benefit. Independent mobility should be the goal of carers and specialists, even if this means wheelchair ambulation in those who can only achieve household or therapeutic ambulation and transfer skills—a reality which many parents are unwilling to accept without sensitive counselling. Attention to the motor difficulties of these predominantly motor disorders should not obscure the need for a holistic approach to the child’s educational, cognitive, social, emotional, visual, auditory, and toileting needs. Appropriate follow up within adult services is also vital, and it is hoped that this overview of some of the important areas will stimulate interest in the adult neurologist. The ultimate vindication of a comprehensive strategy for the care of children, adolescents, and young adults with CP is the emergence of independent adults able to compete in the labour market. *Forfar JOF, Hume R, McPhail FM, et al. Low birthweight: a 10 year outcome study of reproductive casualty. Dev Med Child Neurol1993;36:1037–48. Sullivan PB, Juszczak E, Lambert BR, et al. Impact of feeding problems on nutritional intake and growth: Oxford feeding study II. Dev Med Child Neurol2002;44:461–7. Surveillance of Cerebral Palsy in Europe. Prevalence and characteristics of children with cerebral palsy in Europe. Dev Med Child Neurol2002;44:633–42. *Jacobsen LK, Dutton GN. Periventricular leucomalacia: an important cause of visual and ocular motility dysfunction in children. Surv Ophthalmol2000;45:1–13. Salati R, Borgatti R, Giammari G, et al. Oculomotor dysfunction in cerebral visual impairment following perinatal hypoxia. Dev Med Child Neurol2002;44:542–50. *Goodman R, Graham P. Psychiatric problems in children with hemiplegia: cross-sectional epidemiological survey. BMJ1996;312:347–54. *Nelson KB, Ellenberg JH. Children who ‘outgrew’ cerebral palsy. Pediatrics 1982;69:529–36. *Strauss D, Cable W, Shavelle R. Causes of excess mortality in cerebral palsy. Dev Med Child Neurol1999;41:580–5. *Crothers B, Paine RS. The natural history of cerebral palsy. Classics in developmental medicine No 2. Edited by Mitchell R. London: Mac Keith Press, 1988 (first published 1959). *Sala DA, Grant AD. Prognosis for ambulation in cerebral palsy. Dev Med Child Neurol1995;37:1020–6. Andersson C, Mattsson E. Adults with cerebral palsy: a survey describing problems, needs and resources, with special emphasis on locomotion. Dev Med Child Neurol2001;43:76–82. Gordon AM, Charles J, Duff S. Fingertip forces during object manipulation in children with hemiplegic cerebral palsy II: bilateral coordination. Dev Med Child Neurol1999;41:176–85. Lin J-P. The pathophysiology of spasticity & dystonia. In: Neville B, Albright AL, eds. The management of spasticity associated with the cerebral palsies in children and adolescents. Churchill Communications, 2000:11–38. Leonard CT, Hirschfeld H, Forssberg H. The development of independent walking in children with cerebral palsy. Dev Med Child Neurol1991;33:567–77. *Sutherland DH, Olshen RA, Biden EN, et al. The development of mature walking. Clinics in Developmental Medicine 104/5. London: Mac Keith Press, 1998. Lin J-P, Brown JK, Walsh EG. The continuum of reflex excitability in hemiplegia: the influence of muscle length and muscular transformation after heelcord lengthening and immobilisation on the pathophysiology of spasticity and clonus. Dev Med Child Neurol1999;41:534–48. Russell DJ, Rosenbaum PL, Avery LM, et al. Gross motor function measure (GMFM-66 & GMFM-88) users manual. Clinics in Developmental Medicine No 159. MacKeith Press. Distributed by Cambridge University Press, 2002. *McLaughlin J, Bjornson K, Temkin N, et al. Selective dorsal rhizotomy: meta-analysis of three randomized controlled trials. Dev Med Child Neurol2002;44:17–25. *Collet J-P, Vanasse M, Marois P, et al and the HBO-CP Research Group. Hyperbaric oxygen therapy for children with cerebral palsy: a multicentre placebo-controlled randomized clinical trial. Lancet 2001;357:582–6. *Hardy P, Collet J-P, Goldberg J, et al. Neuropsychological effects of hyperbaric oxygen therapy in cerebral palsy. Dev Med Child Neurol2002;44:436–46. Damiano DL, Dodd K, Taylor NF. Should we be testing and training muscle strength in cerebral palsy? Dev Med Child Neurol2002;44:68–71. Campbell WM, Ferrell A, McLaughlin JF, et al. Long-term safety and efficacy of continuous intrathecal baclofen. Dev Med Child Neurol2002;44:660–5. *Mutch L, Alberman E, Hagberg B, et al. Cerebral palsy epidemiology: where are we now & where are we going? Dev Med Child Neurol 1992;34:547–55. Zupan V, Gonzalez P, Lacaze-Mamonteil T, et al. Periventricular leucomalacia: risk factors revisited. Dev Med Child Neurol1996;38:1061–7. Kuban KCK, Leviton AL. Cerebral palsy. N Engl J Med1994;330:188–95. Amiel-Tison C, Gosselin J, Infante-Rivard C. Head growth and cranial assessment at neurological examination in infancy. Dev Med Child Neurol2002;44:643–8. *Baker R, Jasinski M, Maciag-Tymecka, et al. Botulinum toxin treatment of spasticity in diplegic cerebral palsy: a randomized, double-blind, placebo-controlled, dose-ranging study. Dev Med Child Neurol2002:44:666–76. Gordon AM, Duff S. Fingertip forces during object manipulation in children with hemiplegic cerebral palsy I: anticipatory scaling. Dev Med Child Neurol1999;41:166–75. Neville B, Goodman R. Congenital hemiplegia. MacKeith Press, distributed by Cambridge University Press, 2000. *Osler W. The cerebral palsies of children. Classics in developmental medicine No1. Edited by Mitchell R. London: Mac Keith Press, London, 1987 (first published in 1889). *Scrutton D, Baird G, Smeeton N. Hip dysplasia in bilateral cerebral palsy: incidence and natural history in children aged 18 months to 5 years. Dev Med Child Neurol2001;43:586–600. *Stanley F, Blair E, Alberman. Cerebral palsies: epidemiology & causal pathways. Clinics in Developmental Medicine No 151. Mac Keith Press. Distributed by Cambridge University Press, 2000. *Original or classic texts or recent landmark studies in the field of cerebral palsy which have extended our understanding of the classification, natural history or therapeutic approaches to management as well as large population studies. Other references support the text and provide up to date studies on important areas of clinical interest.